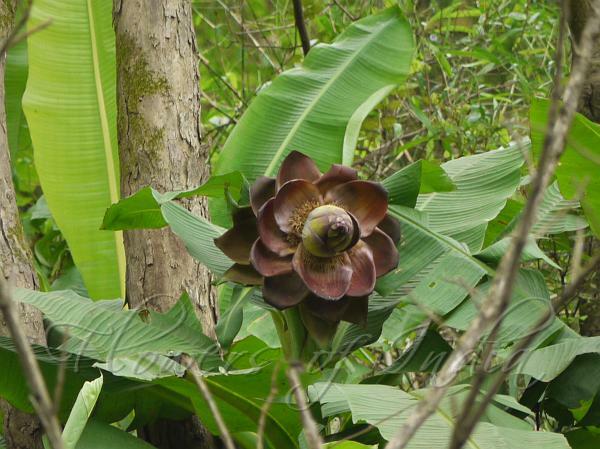 Rock Banana is a plant commonly found in the Western Ghats and other parts of the peninsular India. Plants may grow up to 12 ft tall and the psuedostem may be up to half the height with a swollen base up to 8 ft in circumference at the base. The leaves are bright green in colour on both sides with a deeply grooved and short stalk. The leaf sheaths are persistent at the base and leave closely set scars on the corm. Flowering begins with a 1 ft wide round inflorescence, later drooping and elongating to 2 ft in length. The bracts are orbicular, dark brown-red (dull claret- brown), reaching 1 ft. The fruits are about 3 inches long and more or less triangular with dark brown seeds. The upper parts of the plant die out during the dry season leaving the corm, which forms new leaves at the beginning of the monsoon.